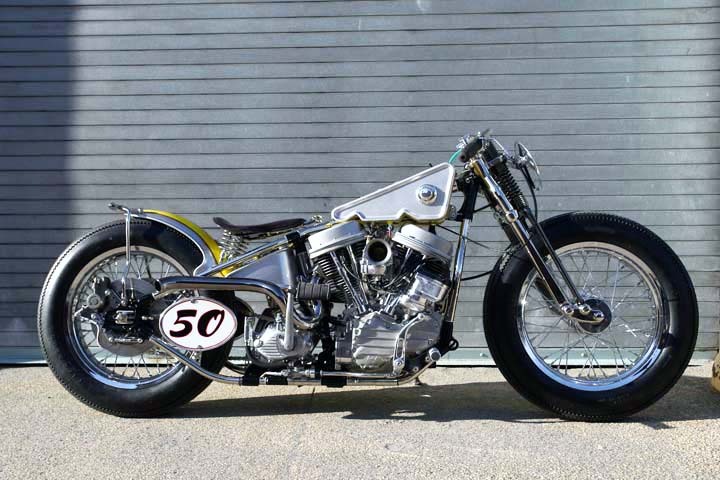 Walt Siegl built this amazing panhead chopper for the artist, Arthur Sordillo. Walt is a motorcycle builder out of New York City who has been riding and building Harley choppers, bobbers, and race bikes in the old school style for more than 20 years. When we say old school, we mean he makes pretty much every part by hand. This Sordillo Salt Flat was part of the art exhibition “Oldskool — a survey of 20th Century Motorculture,” curated by the painter Gregory Johnston. Walt still road races V-Twins and is constantly surprising people with his amazing eye for custom bike building. To see more of Walt’s work check his impressive gallery.